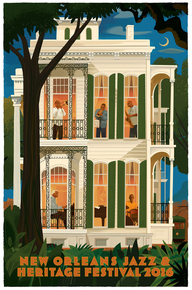 2016 Jazz Fest Poster - "House of Swing"
Don't cry for New Orleans. While it was a time to mourn the loss of a great talent, Prince, the New Orleans Jazz Fest was a confirmation and celebration of the reincarnation of the City many had written off as dead a decade earlier. New Orleans is again playing the music of "we" and serving-up the multiplicity of seeds, roots and flowers that are America. It is a welcome, even desperately needed resonance when fear and exclusion have come to dominate from political rhetoric to cultural xenophobia. America needs New Orleans to remind us of not only where we have come from but also where we can go. The New Orleans Jazz and Heritage Festival delivers and brings into harmony the melody of diversity. This year's two week Festival (46th) was a far cry from those rustic events on the vast infield of the Fair Grounds Race Course, between Esplanade and Gentilly, when New Orleans was part of our educational (Tulane and Loyola University) and cultural foundation in the 1970's. Then, the dynamism of rapid social change, the cracking in the walls of segregation and exclusion, was reflected in the music from jazz hall to church. 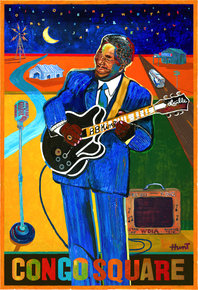 The Jazz Fest rapidly thereafter evolved into a global stage under the leadership of both artists and civic leaders reflecting the mosaic of New Orleans, African-American to Cajun, Jewish to Muslim, LGBT to clergy. Global Music Greats on Pilgrimage while Locals Nurture the Mecca! The seeds and roots of what is much of America's music from Nashville to Chicago, Seattle to New York were both adequately represented and then performed with great satisfaction to the audiences. Cajun bands, (Robert Jardell & Pure Cajun), performed at the Lagniappe Stage. Traditional jazz to its more avante- garde manifestations were featured in several oversized tents overflowing with young and old. The gospel tent echoed with inspirational hymns that one did not need to be a Christian to absorb the art and spiritualism. The overflowing blues tent, immediately adjacent had some of the most memorable performances as well as projecting artists with local links who otherwise normally perform in small road houses and Treme bars but now had thousands gasping and screaming for more. Little Freddie King and Johnny Lang could have done encores into the next morning. Its Own & Evolving Beat! New Orleans has its own hip hop roots, just different enough that the performance by several local artists on the "Congo Stage" stood out for energy and artistic creativity. The addition of violin by one of the local artists was not only a new sound but the opening of the door to perhaps new innovations in hip-hop. Perhaps it is my imagination, but I could trace the root of New Orleans' own hip-hop sound to the several "Mardi Gras Indian Troupes" that performed at the "Heritage Stage." (Many of New Orleans and regions "Black" population also has Native American roots when many escaped slaves found refugee among local American Indian tribes, although some tribes also practiced slavery.) These Mardi Gras troupes also marched through the Fair Grounds venue with colorful costumes and rhythmic singing/percussion adding to the sense of Festival. Besides the James Rivers Movement, I have developed an affinity for several other local sounds. "The Honey Island Swamp Band" we first saw and heard at the "Green Parrot" in Key West. As is our habit, we first sit outside this musical venue to see if the music, energy and rhythm inspire us. Before we knew it we were drawn inside weaving and then dancing to their entrapping fusion of blues and Southern honky-tonk. As we were walking out of the Festival, I heard two men who in appearance seemed to belong to two different worlds. One said, "with all the crowds, there was not one fight that I see." Then I realized that I had been shoved and shoving through throngs and the only thing that anyone had to say to me was to offer me a joint. When the police appear bored, even if vigilante, you know that's good for the crowd and the police! Raining Purple, Green and Gold! The second weekend of Jazz Fest experienced unusually stormy weather, well perhaps not any more abnormal than the cloudless first weekend when Purple Rain doused the crowds below as a plane painted tributes to Prince above. New Orleans had also lost in the last year some of its own greats, (most notably Allen Toussaint), generally only personally felt by the intimate local music community. The visiting performers from around the country though knew the names, acknowledged the inspiration and influence, particularly the Red Hot Chili Peppers who brought on the standards from The Meters, The Neville's and Radiators to play a couple of songs with them. The Mississippi River brings through New Orleans much of what the US exports, from agriculture to manufactured. New Orleans' own exports of music and culture ironically may be best appreciated in European jazz cafes and Latin America's plazas. It is too bad that the Ole River does not flow upstream, as culture at least once did to deliver the roots and diversity that now defines American music, jazz to blues to rock. Listen & Watch direct to "New Orleans Jazz & Heritage Festival"